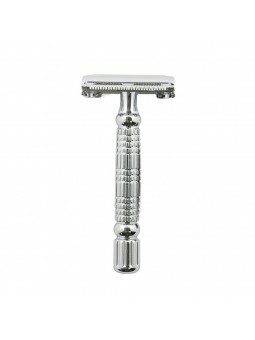 Rockwell 6C Classic Safety White Razor Chrome. A fully adjustable razor for any skin type and stubble length. Cast from premium high-end chromed zinc alloys with a striking White Chrome finish.Perfectly weighted and balanced through unparalleled craftsmanship for intuitive handling and effortless glide. 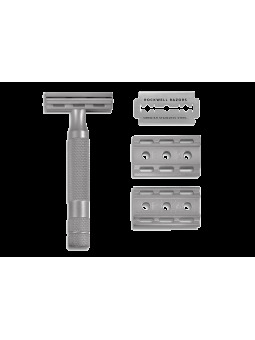 The Rockwell 6C is made of 3 reversible bases and offers six adjustable sizes for different shaves according to the hair type and length and skin state. Patented 6 levels of shaving freedom, to ensure that anyone can redefine the closeness, smoothness, and comfort of their shave. The plates fit perfectly with the Rockwell handle. 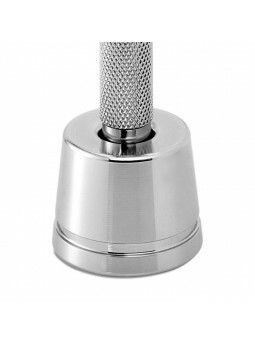 This is an elegant handle with a deep knurled grip for no-slip shaving. The handle´s weight and dimensions have been designed to reach the perfect balance and angle with every plate. White Chrome Alloy plate. Includes a box of 5 Rockwell double edge blades. Say goodbye to razor burn for good and say hello to the closest, most comfortable shave. 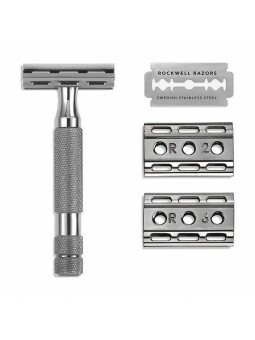 Rockwell 2C Razor-White Chrome. A fully adjustable razor for any skin type and stubble length. Cast from premium high-end chromed zinc alloys with a striking White Chrome finish.Perfectly weighted and balanced through unparalleled craftsmanship for intuitive handling and effortless glide. 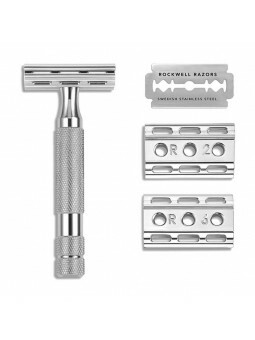 Rockwell 2C is made of 1 reversible base plate that includes Rockwell sizes 1 and 3 - our most popular settings, making the Rockwell 2C a great beginner classic razor or everyday use. The blade angle, without being excessive, allow an efficient shave from the first size. The plates fit perfectly with the Rockwell handle. 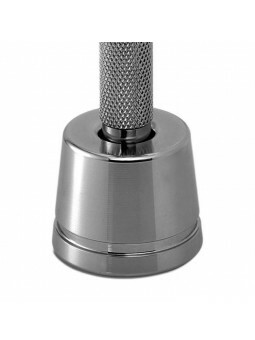 This is an elegant handle with a deep knurled grip for no-slip shaving. The handle´s weight and dimensions have been designed to reach the perfect balance and angle with every plate. 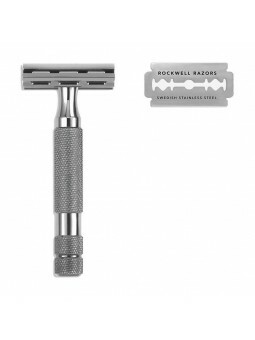 Rockwell 6C Classic Safety Razor Gunmetal. A fully adjustable razor for any skin type and stubble length. Cast from premium high-end chromed zinc alloys with a striking White Chrome finish.Perfectly weighted and balanced through unparalleled craftsmanship for intuitive handling and effortless glide. 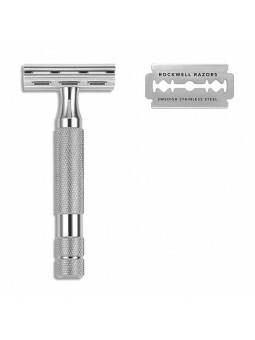 Rockwell 2C Razor Gunmetal. A fully adjustable razor for any skin type and stubble length. Cast from premium high-end chromed zinc alloys with a striking White Chrome finish.Perfectly weighted and balanced through unparalleled craftsmanship for intuitive handling and effortless glide. The Rockwell Stand is an elegant solution to proudly display your Rockwell razor. The Rockwell Stand is an elegant solution to proudly display your Rockwell razor. These perfectly weighted Stands are made from chromed brass, and match the finish of the razor in White Chrome! Designed to Elegantly display your Rockwell Razor for ideal counter-top appeal. The Rockwell Leather Case is the essential tool to keep your razor protected. 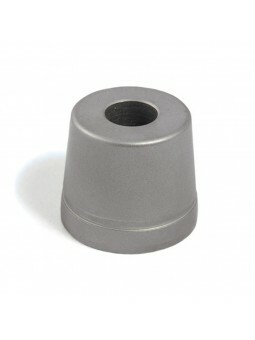 For travelling or protecting from falls or scratches at homes. The case perfectly adapts to all Rockwell models and to most double edge razors on the market. Rockwell Double-Edge Razor Blades are made of Swedish Stainless Steel, and are compatible with all double-edge safety razors. 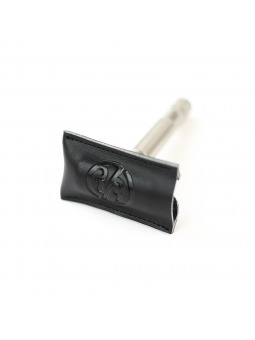 Smooth and flexibles, they allow a comfortable and close shave. The pure stainless steel that forms these blades protects them against rust, while the specialized treatment that crafts these blades ensures the blades retain their exceptional sharpness. The attention to detail and manufacturing innovations that have gone into crafting the Rockwell Double-Edge  Razor Blade have produced a blade that will meet the expectations of all consumers.